Not Mana cyclone level, but this is pretty strong. Come to think of it, I really like this card design-wise. It suits the pacifist "restoration" specialization quite well. I think they made cards for this expansion before nerfs of Wild Growth and Nourish. They didnt want to buff druid. Heal Druid wont be a thing. Remember that you can easily restore health through Zilliax, Earthen Ring Farseer and more neutral minions. Not only the druid specific cards. While I don't like the random stuff, this is actually a strong card. 2/5 is a solid statline, and getting one or two spells out of this should not be too difficult. I like the healing synergy they are pushing for the druids. Suits the class better than the armor one we had now imo. Treants, healing, buffing - sounds like a druid to me. Resto Druid deck? Now I'm very interested to see what the second Druid legendary will be. While there could still be a card that brings this all together, I don't think Heal Druid does enough powerful things to see play, especially when you consider the infinite value of Shaman and Rogue, and the better defensive capabilities of Paladin and Warrior. Turn 3 Play this and get 2 extra cards. Seems pretty good, great statline as well. 3-mana 2/5s that have some level of synergy have historically been strong considerations at least. Resto druid seems to be shaping up. Not sure how it will play ultimately but i am certainly going to give it a shot. Need to get that 500 wins for druid still. Even makes the darkscale healer suddenly fill you hand with spells if you can heal some minions, that you may have damaged with wild pyromancer. Sounds cool, but IMO resto druid will be as successful as freeze shaman was. This is a different way to combat aggro decks. Aggro needs to damage you asap and keep the damage rolling, while this card produces early game value when that archetype is faced. 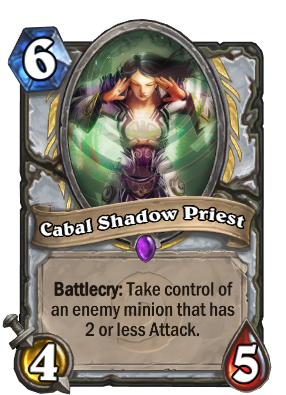 It's cool to see an anti-aggro strategy that doesn't revolve around taunts or cheap board clears. Then it's just a matter of how good and how consistent random druid spells are. 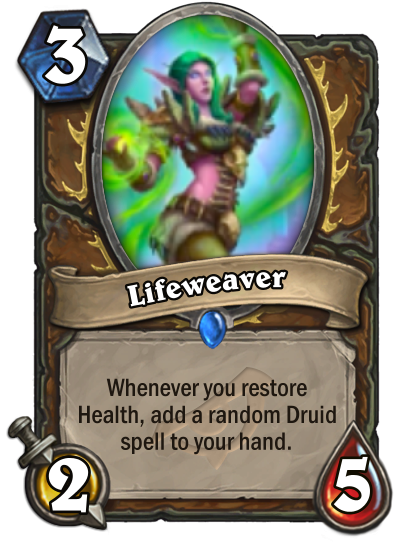 Exactly what Restore druid needed a way to transform heal spells into extra value, great card, druid spells are verry flexible thus verry good with only few bad results. Looks great.